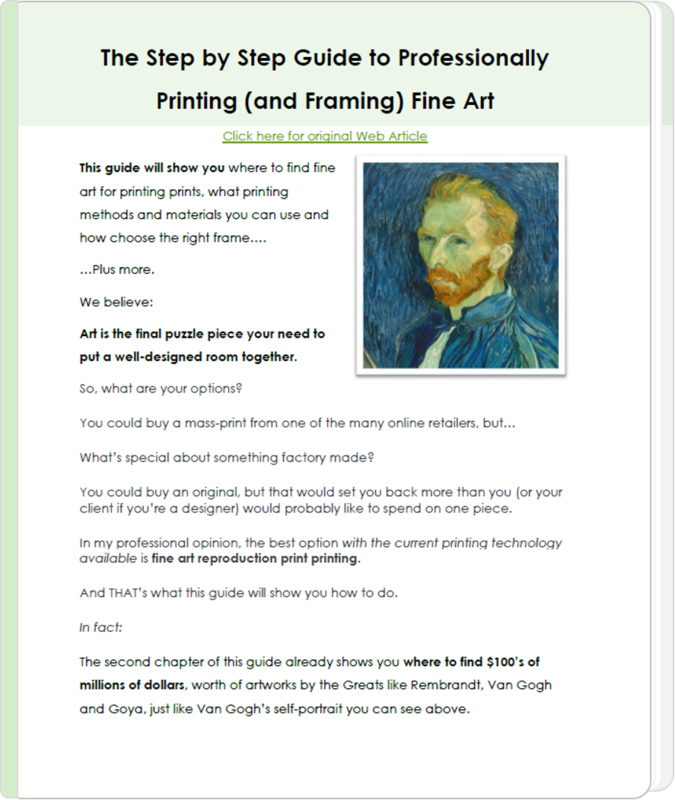 This guide will show you where to find fine art printing for your prints, what fine art printing methods and materials you can use and how to choose the right frame…. Art is the final puzzle piece you need to put a well-designed room together. What’s special about something factory made? You could buy an original, but that would set you back more than you (or your client if you’re a designer) would probably like to spend on one piece. In my professional opinion, the best option with the current printing technology available is fine art reproduction printing. And THAT’s what this guide will show you how to do. 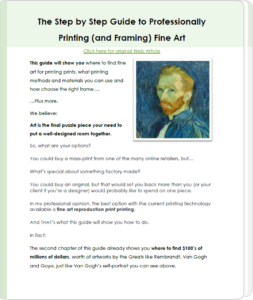 The second chapter of this guide already shows you where to find $100’s of millions of dollars, worth of artworks by the Greats like Rembrandt, Van Gogh and Goya, just like Van Gogh’s self-portrait you can see above. …All for free, ready to be made into custom prints which you can display in your own home or include in your client’s project. How to take care of your fine art prints and more. Want to Download a pdf version of this guide to look at later? 2 Things to keep in mind when looking for artwork. Where to find fine artwork and artistic photos for making prints? 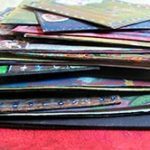 What are Giclee and Offset Printing? Which material should I print on? How to pick the right frame for my fine art print? You don’t want to end up with a granulated image on your wall. …there are a few factors to keep in mind. Any images you plan to use for printing fine art prints should be 240 PPI or DPI in relation to the physical size you expect to print*. 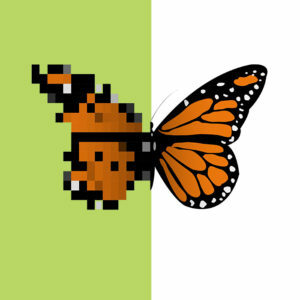 Used interchangeably in the printing world, PPI means Pixels per Inch and has to do with a digital image whereas DPI is Dots per Inch and relates to how many physical dots are printed within any given square inch. Having said that, ultimately how a print looks depends on its physical size, viewing distance and the material on which it’s printed. Professional Billboards are only printed at 15 DPI and glossy professional magazine photos are printed at 150 DPI. Go to the chosen image on your computer. “Right Click” the image file. Go to the “Details” Tab. Under “Details”, scroll down to “Horizontal resolution” and “Vertical Resolution”. There you will see the image’s DPI as shown in the image above in the highlighted green area. * Still unsure how to make sure your image looks great? Get help from a professional printing expert. They have people who can make any image look its best. …a movie studio owns the rights to their movie. Copying or using someone else’s intellectual property without their permission can lead to legal punishment and hefty infringement penalties. When looking for artwork to use for reproduction, you could buy the image from a paid image source. There are already plenty of great Free images out there that you can use legally! These images are either under “public domain”. This means they are public property and can be used however you like. Most artworks that fall under creative commons are not allowed to be sold commercially and often have other such restrictions. 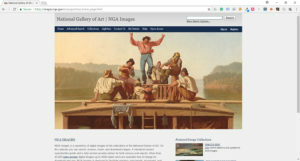 Hundreds of thousands of fine works of art and fine art photography images are available FOR FREE to the public under a public domain license. You can find many masterworks by your favorite classical artists, available for download and for use in your own custom print printing projects. 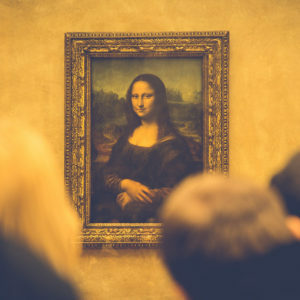 Here are a few of the best – in my opinion – resources to go treasure hunting for some of the world’s finest artworks to use in your fine art prints. 1. The Metropolitan Museum of Fine Art. 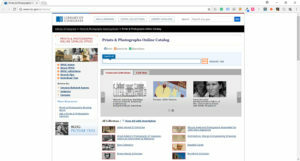 With over 400,000 public domain images of art pieces, the Metropolitan Museum of Fine Art is a great place to start. Tip: Make sure to select “public domain” in your search. The national gallery of art is another great place to look. 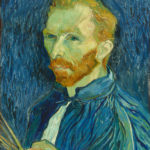 They have over 35,000 works of art from artists including Rembrandt, Van Gogh, and Goya. You literally have access to some of the world’s finest art at your fingertips here. The Library of Congress has many artworks under public domain and in fact just released over 2,500 images of original traditional Japanese artworks for those looking for something classically Eastern. Here’s a direct link. Looking for professional level pixel-perfect photos or illustration to use for printing custom fine art prints? Here are two of the most well-stocked – non-stock photo – resources online. 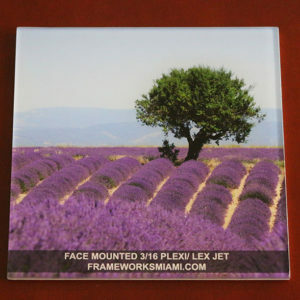 They are especially great for anyone looking for landscapes, animals, or artistic portraits. Unsplash.com is relatively new. It’s only been around since 2013. 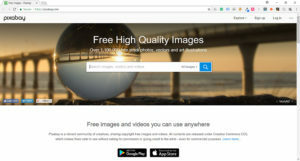 But with over 200,000 photos by professional and hobbyist photographers, it’s one of the best places on the internet to find beautiful images you can print with ease. 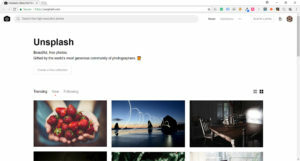 Pixabay is Unsplash’s bigger and older brother. 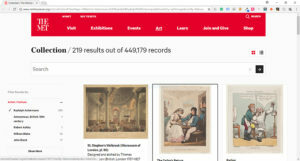 This site has been around since 2010 and has since collected nearly 1 million public domain images and illustrations from contributors around the world. 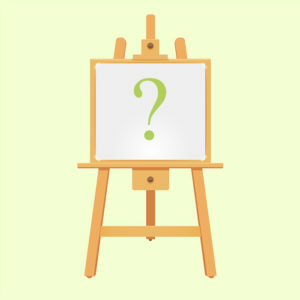 Unlike Unsplash – which is purely a photography library – Pixabay also houses a large collection of original hand and computer generated illustrations. Click here to check out the resources section for 30 more places to find great images. The name Giclee (pronounced Zhee Clay) originates from the French word “la giclée”, meaning something that is squirted or sprayed. Giclee is a printing technique that produces Ultra High quality inkjet prints. Professional artists and printers use high-quality fade-resistant pigment based inks on the archival substrate, which is a special acid neutral photo paper that makes images last longer while maintaining their color. Giclee results in stunning art reproductions in fantastic detail, even from the closest distance. If you’re thinking of having your prints printed using the Giclee inkjet technique, your images need to be a minimum of 300 DPI (dots per inch, like we discussed). This is an absolute must because of Giclee’s fine detail. Offset printing is one of the most widely used and oldest styles of printing and has been around since the 1870’s. When offset printing, an image is split into four “color channels” known as CMYK. This stands for Cyan, Magenta, Yellow, and Black. 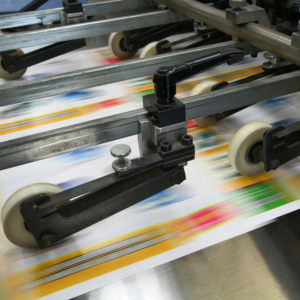 Most mass-produced printed materials are still made today using offset printing. Think of newspapers, books, magazines, and most posters. What’s so good about offset printing? Offset printing can work out cheaper than other styles of printing when dealing with large quantities. Offset printing results in high-quality final images, which is exactly what we are looking for when reproducing fine art. What are some disadvantages of offset printing? A drawback to offset printing is the initial set-up cost. Each new project requires color preparations and configuration. This also means that Offset printing can take time, which can lead to frustrations. Especially, if you need something done urgently. It doesn’t mean you have to print on paper or canvas. There are lots of creative mediums on which you can print fine art. …the options are (almost) endless. The Key to picking the right Material for your art. Emotionally, logically and aesthetically. Does it communicate the overall style you are looking to create? 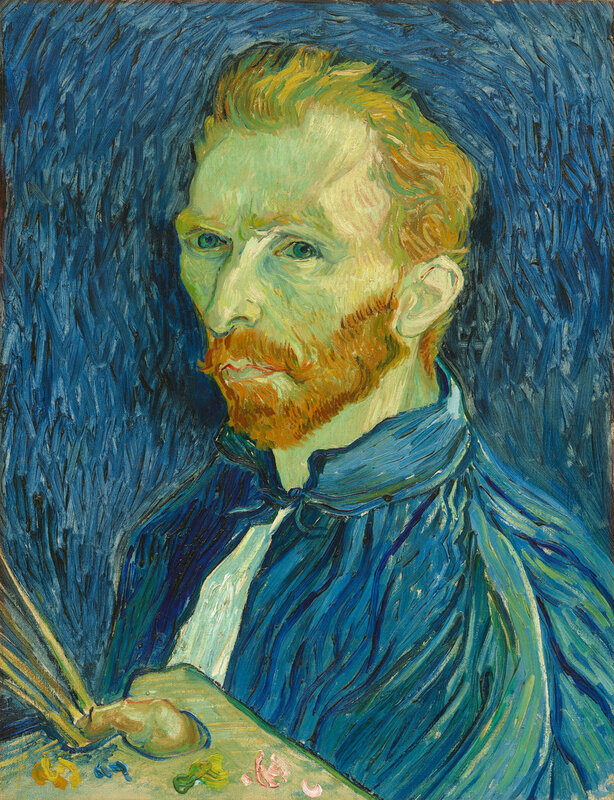 Reproductions of older artworks such as Van Gogh’s or Rembrandts tend to look more “authentic” on matte materials. New, floral, or bright landscapes “pop” more on glossy mediums. There are no set rules of what is wrong or right in fine art printing. Be creative! 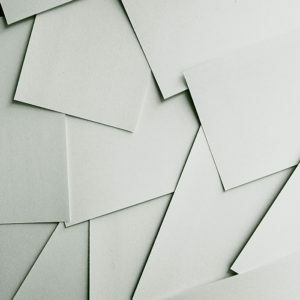 Paper is the most versatile and commonly found printing material. There are many kinds of paper. Each with their own subset of characteristics, value and best uses. Do you want a romantic classical look to your artwork? Then a matte, non-glass paper is often more effective. Or would you like your art to have a more modern and eye-catching sensation? In that case, glossy would be the way to go. But there is more than just matte or glossy. There are four main categories of paper. Matter paper seems a little grainy to the touch and doesn’t have the distinct shininess to it that glossier papers have. It’s great when you want something to have a softer look. Matte paper is also useful for prints which will be kept behind glass. Because it results in much less obstructive glare than its glossier counterparts. In addition, matte paper also has that “paper” texture to it, which is great when making prints people will touch or feel, like when printing a physical portfolio. Luster and Satin are types of what are known as semi-gloss papers. They are halfway between fully glossy and matte. The great thing about a semi-gloss paper is that it will still give you that glossy sheen, but won’t be as intense as glossy, which also becomes highly reflective and often difficult to see at certain angles. Chat with your printer when deciding if semi-gloss is right for your needs. Baryta paper is the standard choice for high-end fine art photography. You’ve probably seen it without even knowing it. Most art galleries use a fiber based paper. Baryta paper uses a chemical called barium sulphate in its coating process. This chemical enhances an image’s detail and definition whilst slowing the print’s aging process, otherwise known as archival permanence. This results in a longer lasting, high quality print. Baryta paper is great for high value pieces you wish to keep for a long time. Glossy paper universally popular for its high d-max and signature shine. (Dmax a measurement of a paper’s maximum density and basically reflects how much black the paper can absorb. This is especially important for us at FrameWorks. Our (new) fine art printer uses four kinds of blacks in every image for maximum image quality. So a paper with a high Dmax can really make the most of the fine art printer’s capabilities. We love glossy paper because it creates bold, striking images. It can also lead to reflective glare. It’s also normally not suitable for reproductions of older or pastel colors where it will contradict the style of the artwork. A popular choice for larger commercial prints and often found in offices and hotels. Brushed aluminum provides a modern look with a metallic sheen where lighter colors are used but a contrasting matte finish on darker pigmented areas. It’s a popular material for artwork displayed outside because of its highly durable and waterproof nature. People tend to love using it as a creative medium for fine art photography depicting city landscapes or scenes with concrete and metal. This high gloss metallic paper provides a “pearl-like” glossy sheen. It’s well-known amongst artists for its brilliant whites and high Dmax, which allows for intense color reproduction. Especially with highly contrasted images. 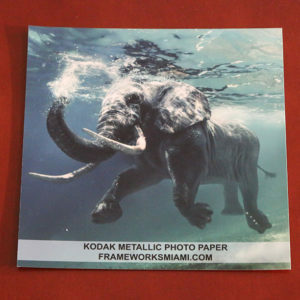 Metallic high gloss photo paper has the advantage a generally long lifespan due to its chemical stability. It is also quick to dry and resistant to moisture damage. A drawback of metallic photo paper is that it requires the right kind of lighting to reveal its best qualities. It’s also not a suggested material when printing skin tones or portraits. Glossy canvases are a popular choice for fine-art reproductions. Likely due to their ability to intensify tonal characteristics of an image and to give a piece of art the sense of deep vibrant colors – even when the original artwork didn’t have them. Pro tip: Glossy materials often mask an image’s smaller details. If your artwork has many intricacies, We suggest going with a matte canvas to accentuate the finer points. 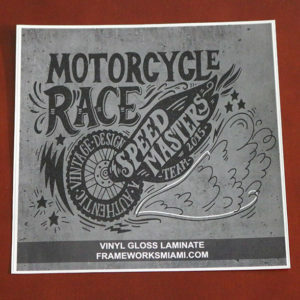 Vinyl is a commonly used material for larger banners and backdrops. It’s easily stored and moved from place to place, which also makes it especially popular for events and temporary installments. Insider info: The Red Carpet backdrop celebrities take photos in front, of is a vinyl print. Acrylic, better known as plexiglass, is a versatile printing medium with many advantages. Plexiglass provides a crisp image. It’s a durable material that can withstand weather changes and hard knocks. You often see outdoor signs printed on plexiglass. Another advantage of acrylic mediums is that they create a “3D feel” to an image. It also allows more light onto an image in comparison to other materials, due to its transparent layer. Allowing it to look stunning even in low light areas. Wood prints create a unique artsy look. 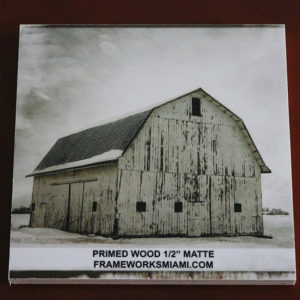 Each wood print is unique, because of the grain differences in the wood itself. Wood works really well when the art subject is wood, such as this barn artwork on the right. Restaurants and cafés often love using wood for their art displays. Next time you walk into a Starbucks, take a look around. You’re bound to see a wood print. A frame can change the whole feeling of an art piece. 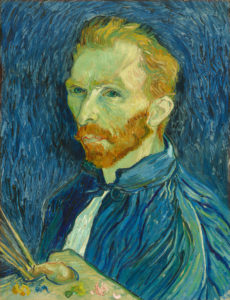 Picking the wrong frame can make even a Van Gogh look dull. Whereas the right frame will complete your art’s story, like the missing piece to the puzzle. Picking the right frame for a piece of art is just as much an intuitive process as it is a skill. If an image if full of life, bold, or very eye-catching in and of itself, a minimalist frame will often help balance the image’s vibrancy and allow the art to hold your attention without seeming “too much”. 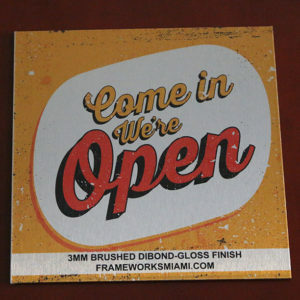 On the other hand, if the print is clear, minimalistic or simple, you can go with a lavish gold or ornate custom frame. The flamboyancy of the frame will help build a bigger story around the artwork, making it part of a larger scene and making the image seem more valuable. 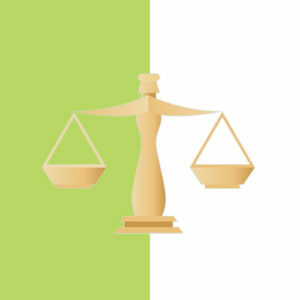 Color matching is a simple design technique used in all areas of creative design from interior decorating to professional branding. In picture framing, this technique is where you take a “sample” color from the artwork and re-use it in the surrounding frame. This creates a subtle consistency between the image and frame. If you have a picture of an orange, you would pick a frame that matches the orange tones seen in the art work, or one that matches the orange’s surroundings in the image. This framing technique is similar but slightly different to color matching. It may be a beach theme, a city theme, a nature theme or something else. Theme matching is when you pick a frame which matches the overall theme of the art. 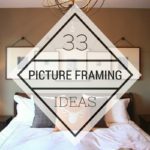 Some like to use a thick wooden frame for a picture of a picket fence, or a bright glossy frame for art photography of a bowl of candy. This is theme matching. Finding the “textures, colors, and motifs” or the art and using them in the frame itself. This technique is different from the others. Instead of looking at the artwork itself, we find inspiration in the space around the artwork, where it will be displayed. If we know the print will be displayed in a hotel lobby with dark leather chesterfields and luxurious stately colors, we may opt for a similar style dark reddish brown frame to align with the theme of the print’s environment. It would look strange to put a beach themed picture frame on a piece surrounded by dark leathers and conservative styles. Merging all of these techniques together. 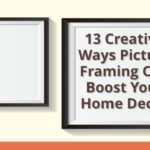 Try to keep each factor in mind when picking a frame. Think about the theme, the colors, the environment and how to contrast or balance the image with the surrounding frame. It’s possible. This can work brilliantly, even when the artwork doesn’t align with the theme or is in fact opposing the environment’s overall theme. 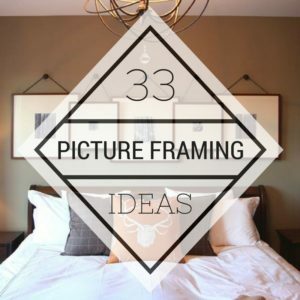 You may like our article with 33 top picture framing tips. Ok. So you have your artwork and it’s framed beautifully. Without the right care, it won’t last long. Here are our top tips for taking care of your fine art prints to maximize their lifespan and vibrancy. Unlike real flowers, prints of flowers – or prints of anything for that matter – don’t like sunlight. Direct sunlight or even artificial light will make your prints fade, quickly. All prints are made with chemicals which react to environmental factors, especially light. …Just like our skin, the sun’s UV rays can also damage and prematurely age your artwork. A good way to protect your prints is to use UV glass or UV acrylic glazing which can block up to 98% of harmful Ultra violet radiation. Keep your prints at least at a medium distance from heat sources. such as heaters, strong lamps, fireplaces and cooking areas to avoid damage. The best would be to hang prints at a minimum of 1-1.5 feet away from lights or heat sources. Humidity (something of a troublemaker here in Florida) is especially damaging to fine art prints. Long exposure to high levels of humidity will quickly cause mold and discoloration. Humidity tends to attract pests like silverfish which also love fine art. Here’s something else you may not have thoughts of. Especially in warmer climate areas, when we water indoor plants, we are inadvertently increasing humidity levels in the plant’s immediate environment. Keep your prints in well-ventilated areas – away from indoor plants. For those up North with colder winters, do not place your prints directly above the heater. Paper and canvas prints can warp and become brittle when exposed to hot dry air for long periods of time. The colors on almost any printed material will also fade and deteriorate when exposed to direct heat sources for longer periods of time. If you would like to hand your prints as part of the décor in a bathroom or kitchen area, we recommend glazing on the front to protect them from humidity and environmental pollutants. Also ensure the back of the print is sealed properly to stop moisture from leaking into the print. Some people go the full Hugh Hughes, with white cotton gloves and face masks when handling prints. I can tell you, it’s not necessary. Just be sure when handling prints, especially paper or canvas ones, that your hands are clean, and free of excessive oils. Also make sure you do not touch the printed areas, the mount board, or the mat. Oily fingerprints can and will leave an irremovable mark. The proper way to handle prints is by gripping opposite corners. For example, grabbing the top right corner and the bottom left. Allow the print to sag slightly in the middle, but be careful of creasing it. Because, it is almost impossible to remove dents, creases or folds from paper prints. Pro printer tip: The borders around an art piece are for handling it. Don’t trim or cut down the excess border on your artwork. It makes it difficult to handle the print without damaging it. If you have prints that have been taken out of their mounted frame for any reason, they should be placed in separate acid-free paper folders and stored horizontally. Under no circumstances should prints be kept with the printed sides touching. This will damage both prints. Make sure the space in which they are kept has a relatively stable temperature and humidity levels. The best is anywhere between 40-60% humidity and 60-80 degrees Fahrenheit (15-25 Celsius). Also, keep an eye out for pests such as silverfish, ants or worms which can severely damage your art. Pro printer tip: One natural remedy for keeping silverfish and ants away is the use of clove oil. Wipe a small amount of clove oil in the vicinity where the prints are kept, but never on the prints themselves. Acrylic and glass casings and frames are simple to keep clean. An easy way to do this is regular dusting. We recommend using a fine duster or a soft rag to carefully remove any dust from the surface of the glass or acrylic. Simply dusting can’t get everything. Properly clean the surface every few months with real surface cleaner. But remember to spray the cleaner on your cleaning cloth or material, not directly onto the glass or acrylic itself. 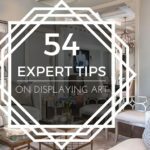 Spraying onto the frame may not be a problem, but cleaners tend to drip and droplets can get onto an artwork’s frame or mat which could damage the print. Lastly, we recommend using a natural cleaning spray without alcohol or ammonia ingredients, which tend to be harsh. Now that you know all the steps of finding art, printing it, framing it and looking after it, you’re ready to start printing prints with a professional. We’ve collected some of the most useful resources we could find on the internet (including a few of our own) with more in depth tips, tools and techniques in different specific areas of printing. A glossary of commonly used printing terms. 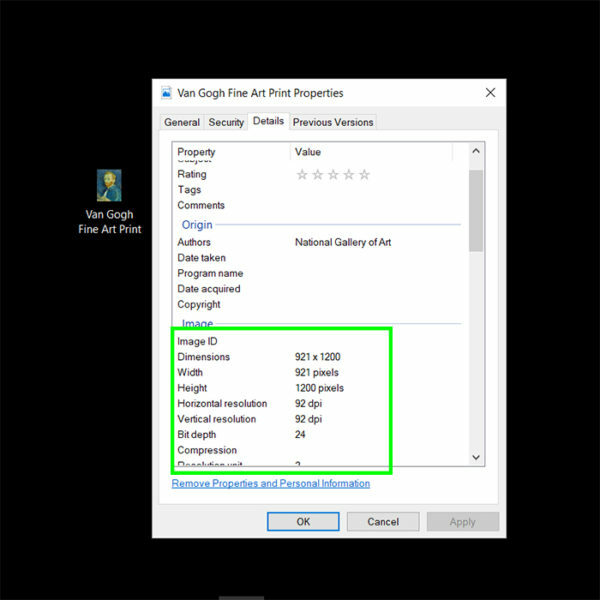 Image Printing – a digital guide to image file sizes. 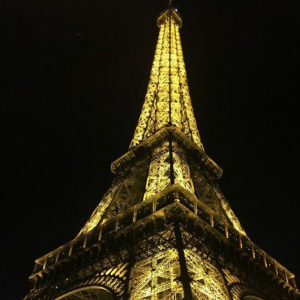 30 Public Domain Image Resources. A deeper look at Dmax and how it applies to your art choices. Photoshop tutorial for color correction and photo retouching. 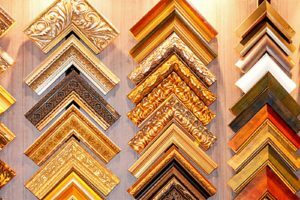 A guide on how to choose the right frame for an art piece. A short but informative video about DPI printing resolution.